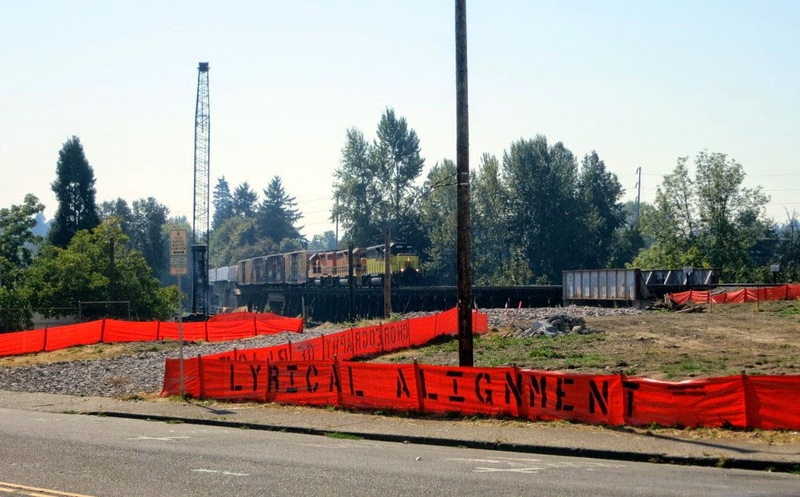 ORANGE LINING: 2 fences printed onsite, 1 in Milwaukie the other visible from SW Harbor. 2 fences printed onsite, 1 in Milwaukie the other visible from SW Harbor. 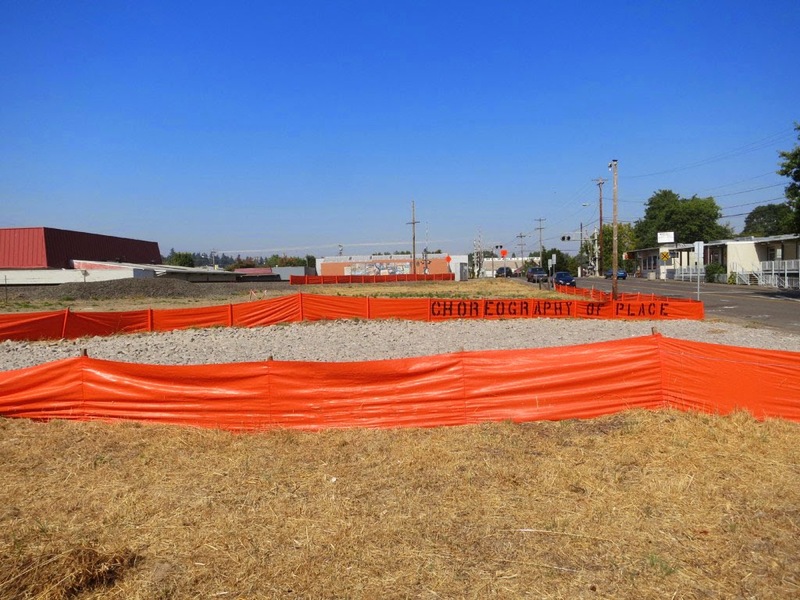 We recently completed our on-site silt fence painting with one line on the east side of the river and one on the west. There are still quite a few more rolls of pre-printed lines waiting to be installed. The locations of those installations are not up to us, they are placed by the contractors wherever needed for erosion control. 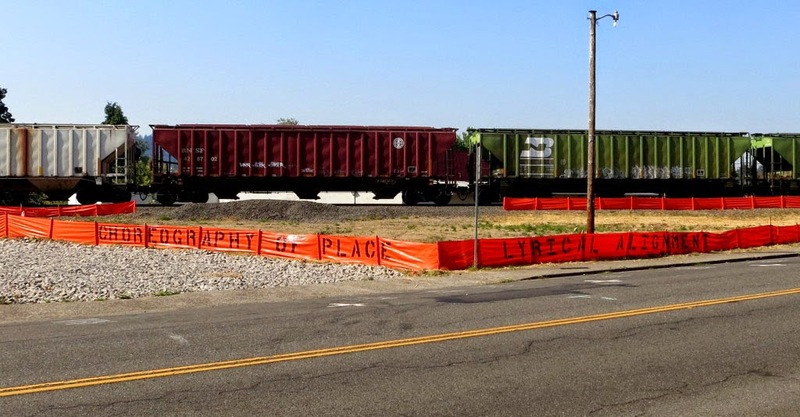 The line “CHOREOGRAPHY OF PLACE, LYRICAL ALIGNMENT” by Peg Butler (me), was painted onto silt fencing that had been installed on SE 21st Avenue near SE Lake Road in Downtown Milwaukie. Just as we finished, a freight train rolled by. Over on the west side, the latest and last poem to be painted was “EVEN NOW THE HEART IS FLOWERING A WILD PATIENCE” by Amy Schutzer. 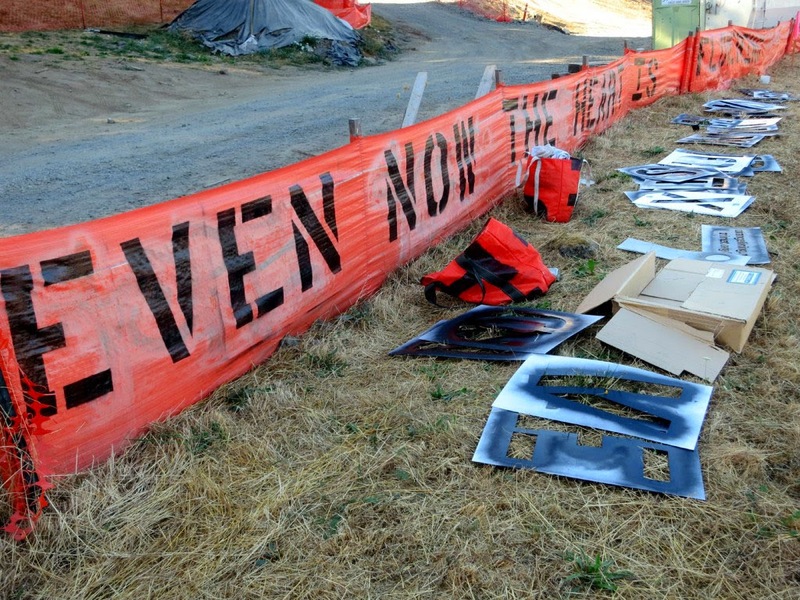 This fence is most visible from SW Harbor Parkway at SW Moody Ave. It’s up on the hill and was a bit tricky to paint because of the steepness. Luckily no hill-falling-down happened. One thing I liked about this site, in addition to its great visibility, was that it had been tagged formerly. We got to tag on top of the tag with a poetic line. After finishing with painting, I walked down past the International School to the intersection to take photos wearing my PPE (hard hat, safety glasses, safety vest, steel toed boots...) which I’m required to wear whenever I’m out working around the construction areas. As I walked by the school, four boys about five years old who were out on recess shouted to me over and over, “What are you going to build? What are you going to build?” I gave them a sturdy wave in my construction worker costume and left my building accomplishments to their imaginations.